Ever since the weather warmed up, I've made it a point of smiling at every person with whom I make eye contact. This is probably a more selfish pursuit than it sounds because it is such a pleasurable experience to smile at someone and have that someone smile back. It's a simple, non threatening gesture (like small talk) but since I'm new to town, it also makes me feel like part of the community. Believe it or not, as cultured as New York was and as cool as Montreal was, those places became home to me mainly because I became a part of the neighborhood. From the cashiers at Gristede's or the college guy helping out his dad at the Pizza place downstairs in Kip's Bay to the saucy Portuguese lady at the bakery or the Bangladeshi dishwasher on our corner in the Plateau were among the things I missed most when I left each of these homes (well, that and the murals I painted). With each person, it started with a smile and a bonjour and this weekend, we got a taste of home here in Toronto while trolling the neighborhood looking at gardens. We're working on our own garden and needed a little inspiration and direction. 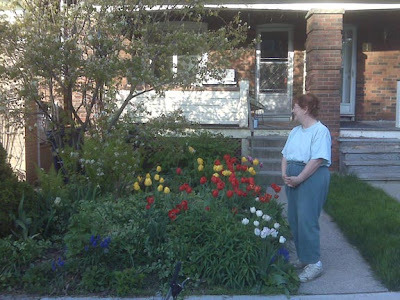 We came across a lovely "low maintenance" garden that we both adored so we started taking notes and pictures when to our surprise, the owner came outside! 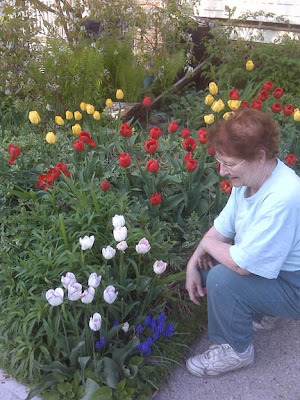 She was so sweet and spent time explaining her garden, naming all the flowers, blooming times, tips and tricks. Of course, I became overwhelmed (re: I faded out) but Sanj was right there with her writing everything down and asking questions. She must have spent an hour with us and we were so thrilled! 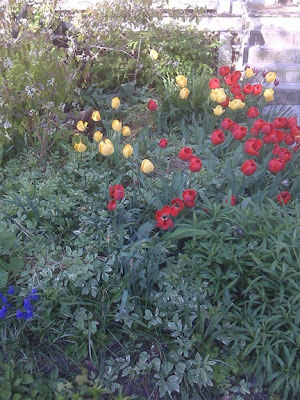 Of course, talking to her also gave us an idea of how much effort it actually takes to start a low maintenance garden. So, we decided it was best to do our research and build the garden up in stages. Imagine our surprise when we found a package at our front door the next day. Our neighor had left a bag of some gardening magazines, a card and a bunch of notes on local nurseries. Is that the sweetest thing you've ever heard? 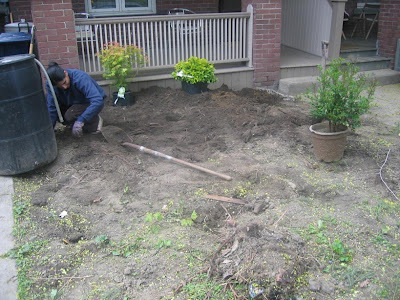 We were so touched and inspired to work that much harder on our garden. Besides, another great way to feel like a part of the neighborhood is to be outside gardening, everyone stops to say hello! We're so happy we have a new place to call home. 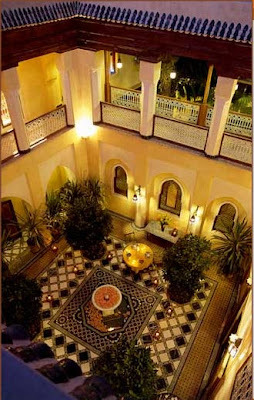 Sanj and I are planning our trip to Morocco and have become obsessed with the amazing Riads we’ve been researching. 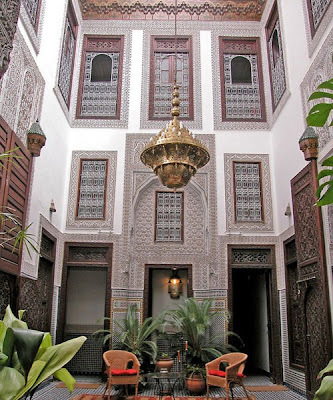 Riads are traditional Moroccan abodes with open air central courtyards and traditional Islamic architectural design that have become a cornerstone for authentic lodging. Hidden in the maze of winding lanes and back alleys, behind relatively unassuming doors like the one pictured above, Riads are usually found in the Medina, close to the souks and market centers. There are so many amazing spaces, it's been really hard to narrow down our selection. We admittedly cannot afford many of the places, so that's helped. We're also so grateful to have Trip Advisor to help us weed out the losers. 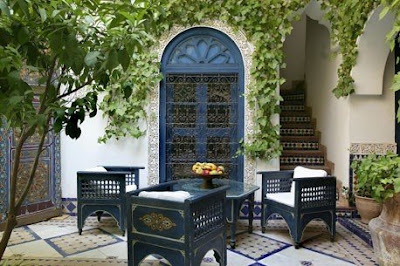 I would consider spending a day just Riad hopping to visit all the inspiring spaces we've seen in pictures. 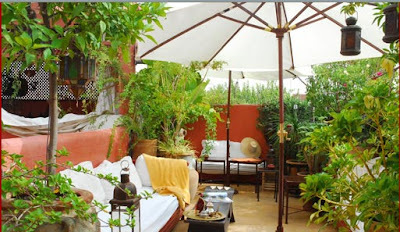 Here are a few of my favorite outdoor spaces, photos courtesy of each riad's website. An opulent haven in the middle of the medina, the Riad Al Moussika in Marrakesh is one of the more expensive places to stay ($350-$500). I must have contacted Dar Cordoba in Fes at least 5 times asking them in different ways if they had availability. The inner (well, not so inner) child in me just didn't want to take "no" for an answer because this place is so beautiful and affordable. Alas, it wasn't meant to be! Another Stunning Courtyard I picture myself sitting here having a cup of mint tea, do you think they would notice that I'm not a guest there? 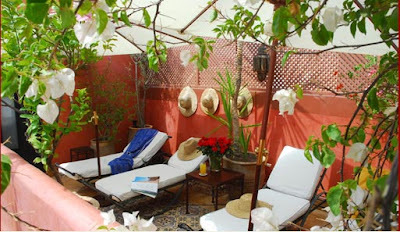 I love this tranquil space at Riad El Borj in Marrakesh. It's so ornate and detailed but subtle and calming at the same time, I wish I could transport it to my backyard. We've been trying to figure out what to do with our upstairs patio and the all the beautiful terrasses we've seen are so inspiring. The space at Riyad el Cadi in Marrakesh is not as ornate or complicated as some of the others we've seen, but that's what makes it within our reach. We've been trying to figure out a nice simple way to gain some privacy and shelter from the sun and this tent is a winner! 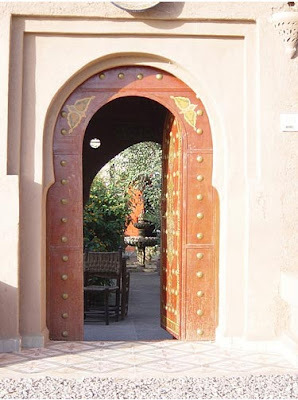 Thanks to Maryam in Marrakesh for pointing this place out to us. 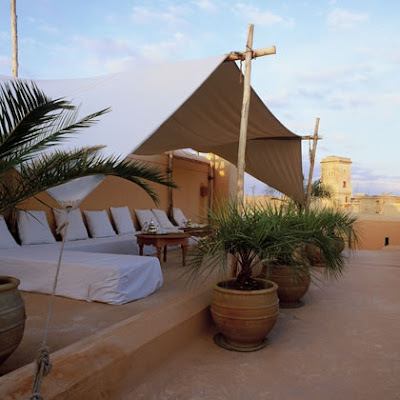 While I really like the tent from the last Riad, I like the more traditional seating and lush greenery of Terrasse des Olivier in Marrakesh. This is truly an oasis in the city and one I hope to create the same lush and relaxing space at home. As some of you already know, we've had a tough few months and we're really looking forward to spending some time away. Sanj has been so wonderful and supportive the last few months, it's amazing how tough times can bring a couple closer together. Of course, it's much less stressful and equally amazing how fun times can bring a couple closer together as well! We deserve this trip and I cannot WAIT! 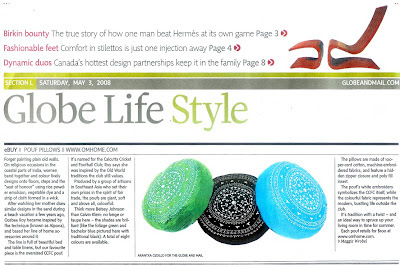 Thank you so much to Maggie Wrobel over at the Globe and Mail for her piece in this weekend's issue. What a thrill for us!! 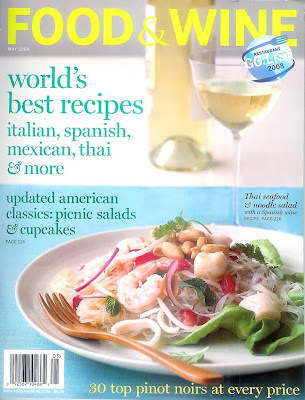 Thanks to Jessica over at Food & Wine magazine for using our Middleton Row Placemats in Loreto Sweater in their May issue. 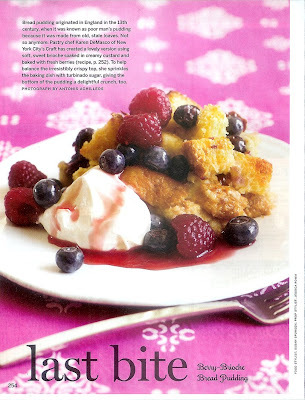 The dessert looks delicious and makes me eager for summer to come so I can pick up fresh berries from the farmer's market. It’s the perfect topping to granola, yogurt and honey!